Part of the Meadow Days Collection! Encouraging your baby's development by inspiring Moments of Wonder. 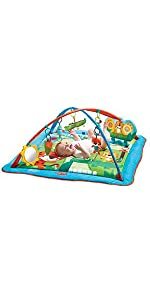 Tiny Love Meadow Days Super Mat, Baby Playmat Developmental playground of wonder and discovery. 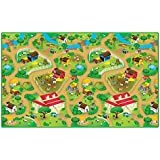 A Super Mat for super fun! 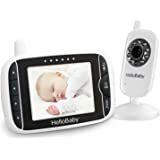 Tiny Love is a toy and baby product company that puts special emphasis on baby’s development from birth and offers smart solutions to parents’ genuine needs. Our new Meadow Days collection features a lovable cast of characters called the Tiny Pioneers, each named after famous explorers and pioneers such as Marie Curie and Thomas Edison. These engaging characters inspire exploration, discovery, excitement, optimism and friendship adding a whole new dimension of fun for babies to enjoy. Suitable from birth to approx. 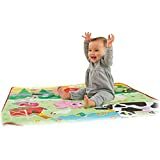 12 months, the Tiny Love Meadow Days Super Mat is an extra-large playground with nine activities that inspire baby's imagination & curiosity and encourages the development of their senses, fine and gross motor skills. 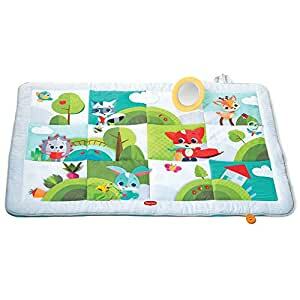 As part of the Tiny Love Meadow Day range, this portable playmat features the adorable Meadow Days characters with variety of textures, illustrations and toys for endless fun and discovery. Due to its large size, the Super Mat is ideal for bonding time between baby and parent and for play dates with plenty of room for two children. The first couple of months your newborn spends most of their time lying on their back. 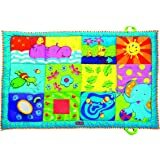 Your little one will enjoy lying comfortably on this well padded playmat while discovering its surrounding. 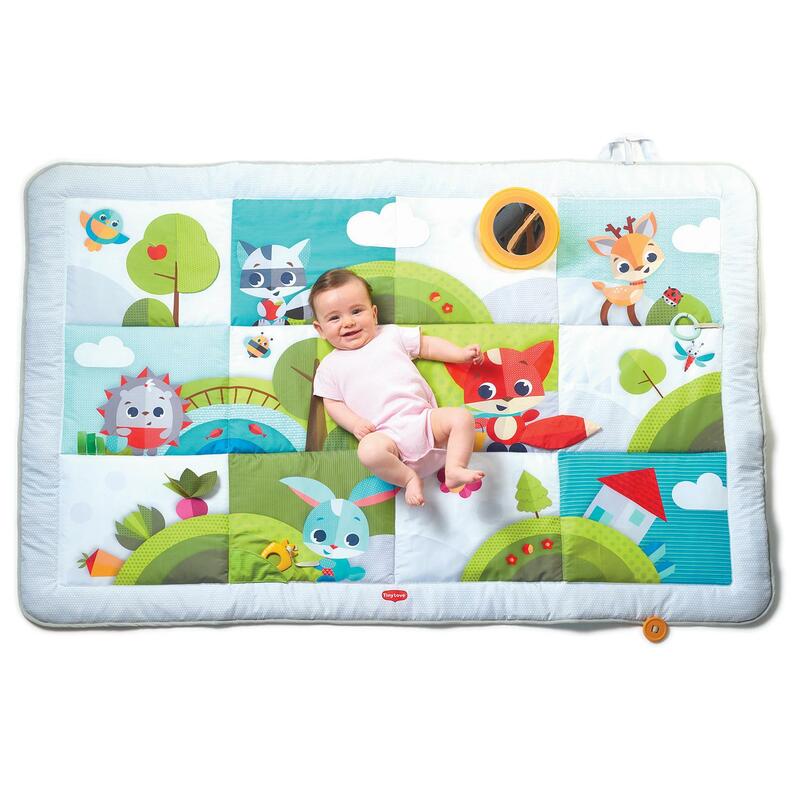 Parents can lie next to their baby on the extra-large Meadow Days Super Mat and bond with their new bundle of joy. Slowly introduce your baby to the nine activities of this Tiny Love playmat and stimulate their development from an early stage. 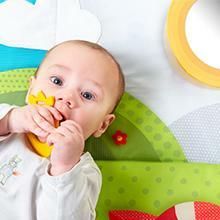 Encourage your baby to lie in tummy time position by engaging them with various activities on the Super Mat. Placing your baby on their tummy supports the development of their gross motor skills which is a major milestone in their growth. Extensive tummy time play strengthens baby’s upper body muscles and stimulates physical development, such as head and neck control, rolling over, crawling, sitting up and pulling to stand. From approx. 5 months, your baby will be able to sit up to discover the Meadow Days Characters on the illustrations and explore the nine activities from a new and exciting angle. The Super Mat sparks baby’s imagination & curiosity and promotes the development of their senses, fine and gross motor skills. 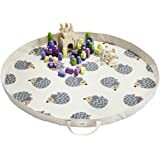 Each area provides different types of stimuli with a variety of textures, illustrations and toys ranging from a crinkly fox tail to an engaging peek-a-boo tree and more. 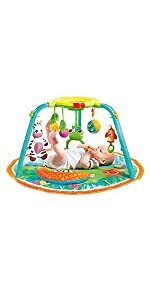 On the Tiny Love Meadow Days Super Mat your baby will discover various activities ranging from carrot teether to crinkly fox tail which simulate the development of their fine motor skills. Fine motor skills are related to the hand, palm and finger muscles as well as to the muscles surrounding the mouth and eyes. As baby grows, it is important to ensure that fine motor skills develop in sync with emotional and physical maturity. 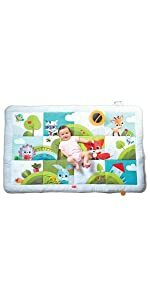 The Tiny Love playmat is designed with colorful and clearly defined illustrations, crinkling sounds and the use of various materials to stimulate baby’s senses. Through our five senses, we receive information from our surroundings and process it through our cognitive skills. Our senses open the world before us and help expand the scope of our understanding at every turn. 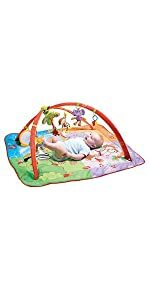 Tummy time play promotes the development of gross motor skills which is a key milestone in their growth, such as sitting, crawling and walking. 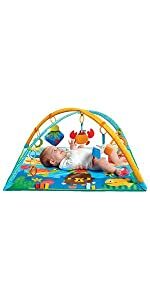 The Super Mat features various activities to encourage extended tummy time play and support baby's physical development. 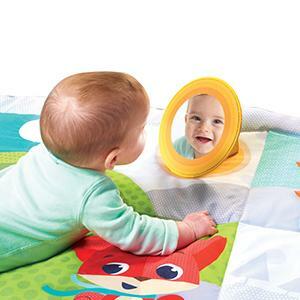 While your little one lies on their tummy their will enjoy discovering the various activities on the playmat and their reflection in the mirror. Creativity & imagination is the ability to mentally produce ideas, thoughts and even feelings and transforming them into reality. This allows us to improvise, take initiative and solve problems. 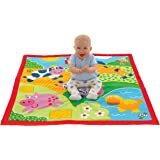 The colourful design of this playmat with its clearly defined illustrations spark baby’s creativity & imagination and encourages playful bonding time with baby and parent. 5.0 out of 5 starsminimal pieces yet not boring! simple and easy! great size too! 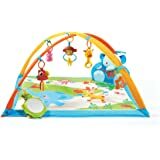 Its cushioned, colorful and has a few play activities on it. 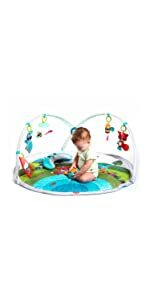 My 8month old loves it, It folds up and is portable, I Wish I had purchased earlier. 5.0 out of 5 starsLove this mat, great quality. Love his mat, it is thick enough so that I can put it directly on my hardwood floors for tummy time without feeling like I have to have a rug underneath. My twins are only a few weeks old, but I feel like I will get more and more use out of this as they get older.